The Kita (Northern) Yatsugatake Ropeway whisks travelers 100-people at a time from the 1771-meter Sanroku (Base) Station to the 2237-meter summit station. The 7-minute ride provides a panoramic view of all 3 of Japan's major mountain ranges, the Southern, Central and Northern Alps. Alpine wildflowers are a main attraction from May to August, peaking from the end of June to early July, accessed via a 90-minute walking trail. 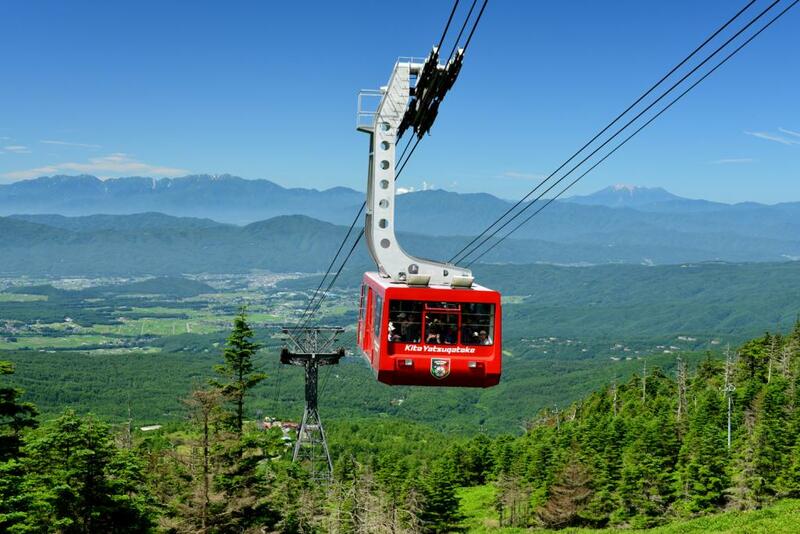 The ropeway is also popular with climbers headed for Kitayoko-dake Mt. Occasionally closed for maintenance or inspection -- confirm in advance. Adult round trip 1900, 1-way 1000. Children round trip 950, 1-way 500. Group discounts available. Round trip not possible for last run. Possible closures due to weather. Confirm the operating schedule before going. From Suwa IC, 40 min (27km) NOTE: Snow tires / chains required in winter. From Saku IC, 65 min (50km) NOTE: Snow tires / chains required in winter. Tateshina-Ai : Indigo dye-themed hotel featuring traditional kaiseki-style dinners.